I know it’s mostly been one pan chicken dinners (or fish) around these parts, so I thought I’d change it up a bit and add some sausage into the mix. 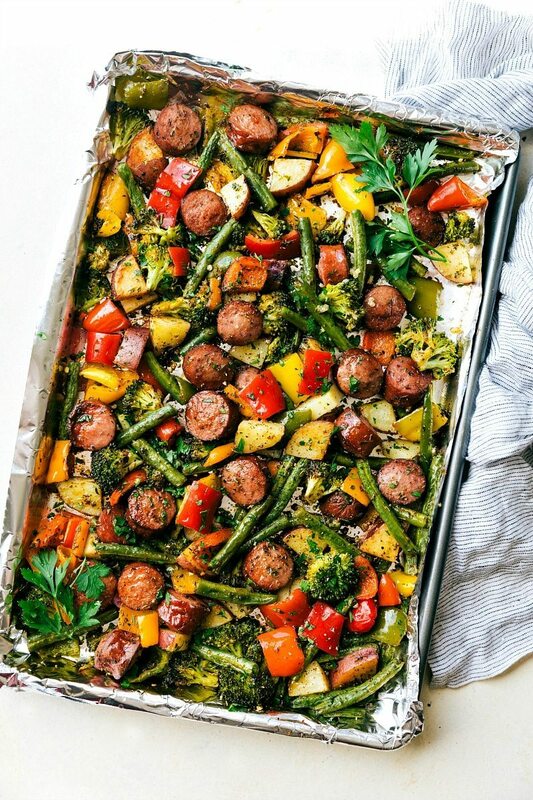 Tons of veggies & sausage mixed with herbs and olive oil and then all tossed together on one foil or parchment-lined pan = ridiculously fast prep, insanely quick clean-up (like none really), and so much delicious flavor. 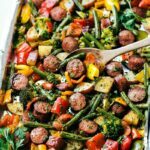 This is a one pan healthy dinner that you are going to love! This meal was inspired by the husband. He’s been wanting to bring in more lunches to work and while his idea of a lunch is his last-minute slapped together pb&j (not horrible I know, but..), I’ve wanted to step in and help a little. So, sheet pan chicken dinners came to mind — make an entire dinner Sunday night and he could enjoy it all week long. Except, by day 2, the breading on the chicken dinners wasn’t all that great. So that idea was vetoed. And then I thought about these sausage and veggie foil packs that he loves and knew it would be a great idea to change that into a lunch for him. 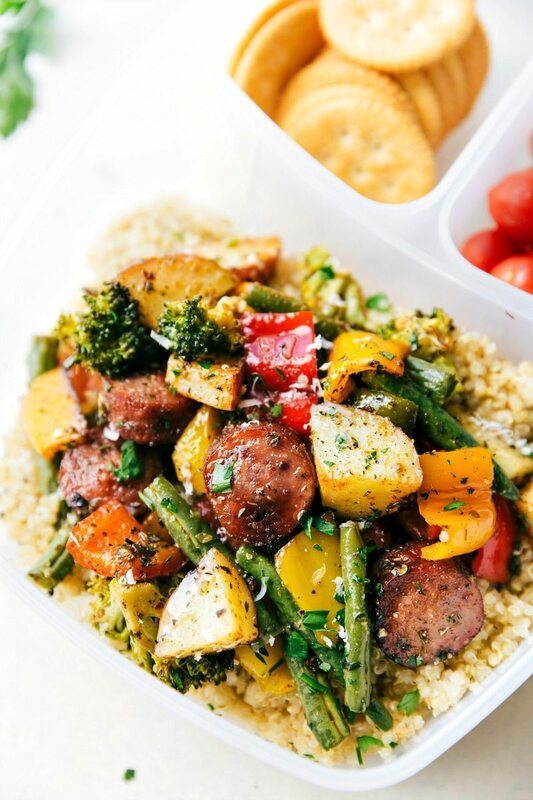 Make one huge tray of these veggies + sausage and a big batch of quinoa (or rice) and voila: easy and healthy lunches for him for an entire week long. Also, we usually use turkey sausage since we love it, but use whatever sausage you like best. I did try a chicken sausage for the husband one week and that got great reviews as well! And last but not least, if you are enjoying this straight out of the oven, try some freshly grated Parmesan because that is out-of-this-world. It takes the roasted veggies to a whole new level! I made this today, and ate until I almost burst! Delicious! My boyfriend also loved it. The parmesan – amazing! ? Greetings from Norway! Agreed. It’s extremely high! Maybe if you use a different sausage, the numbers will come down a bit? The 6 Tbsp of oil is a ridiculously high amount, and you can reduce that *a lot*, especially since even turkey smoked sausage is high in fat. I use about 2 Tbsp of oil (so 1/3 of the recommended amount), which cuts the fat and calories considerably. I made it the first time with the entire 6 Tbsp and it was greasy and unpleasant, IMO, but I love it with less oil. I cut back on the Olive Oil and omitted the salt, leaving only the sausage with sodium( the sausage is high in sodium only if you eat every single piece of it yourself) and the cheese, depending on the brand of the cheese used. Still delicious and healthy. Or just omit the sausage completely and eat the veggies over Quinoa. I was totally excited to make this. I was disappointed that all the food was Not done when we were supose to eat. I have a picky husband and I can’t feed him food that’s not cooked. I left it in longer then you stated and then I cooked it some more. ? Hmm, is your oven calibrated to the correct temperature? And did you chop the veggies relatively small? I haven’t had or heard of any problems with the cook time being off from other readers. Did you cook anything first besides the meat? Do you put the sausage in raw? I’m pretty sure that smoked turkey sausage is cooked, at least that’s what is says on the label. If you use raw fresh link sausage it doesn’t cut into pretty circles unless you bake or fry it first. True. That’s what I used (Hillshire Farms, I believe) and it is definitely already cooked. Can this be cooked on a grill/ barbecue? If so, how long would you recommend it be cooked? Should it be left open on a flat pan or wrapped on foil? Cooking this tonight! Adding diced sweet potatoes in place of the regular potatoes and adding mushrooms and Brussels sprouts….all over quinoa! I get a great mixture of frozen vegetables from Costco. Could I use these? Would I thaw first? I will definitely be trying this! One question, can you use frozen veggies or do they have to be fresh? I’d definitely recommend fresh 🙂 Enjoy! This meal was fantastic and had a good burst of lots of flavors, would recommend be careful with the spicies I add too much!!! My face is on fire but would 100% recommend this recipe! I used frozen carrots. Worked great! Tasted good too. I also used canned potatoes. I made this for supper last night to rave reviews! I used Italian sausage, zucchini and peppers. It was delicious with the spice combo and parmesan. Definitely saving – Thank You! What kind (brand) of sausage do you use? I got the Jennie O lean turkey sausage but it looks much different than the sausage in your video. Just curious! Do you mean ground sausage? Turkey sausage by Butterball is my absolute favorite!! They don’t have it in the tiny town I’ve moved to so I’ve been craving it. Gotta try this! Could I use sliced turkey hot dogs for the sausage? Tonight I made it for the 2nd time in the last few weeks! The spice mixture is great and I mostly kept it the same. * Both times I used a different mixture of veggies. That is what makes this recipe so great – the versatility – you can just use whatever veggies you have on hand, for the most part. So, here is the version I made tonight that my husband can’t stop raving about (well, neither can I, to be honest)! thanks so much for sharing your recipe! it’s so easy and cleanup is a breeze, especially if you line your pan with foil. ps. also we ate it on small corn tortillas toasted on the stovetop, like little tacos. perfect combo! also good with brown rice. Thank you so much for sharing your version April! It sounds delicious and I’ll definitely have to try that next! 🙂 And yes; the clean-up on this one is my favorite!! Made this for dinner tonight…..absolutely delicious! Does the calories include the quinoa? Nope, you’d have to add that in. Thanks for the question! Have you ever prepped this and then frozen it to cook at a later time? Wondering if this would work as freezer meal? Thanks! Do you have to cover the pan when you put it in the oven? Love this recipe! So easy and full of colour! ? I’ll cook this for my friends. It will go perfectly with a glass of Chardonnay ? What a great meal for a crowd! It has so much flavour ! I think everyone in my family not to mention friends has made it this week!! Can’t wait to use fresh garden veggies next year!! Thanks again!! That is such a great compliment to hear!! Thank you so much Marg 🙂 And yes, garden veggies with this dish is the BEST!! I made a version of this tonight using your recipe as a guide! Munchies entire family enjoyed it. Very colorful and yummy. I showed my kids the picture first to get them excited about the meal so they wouldn’t wrinkle their noses at a plate full of veggies. Worked like a charm. Haha that is brilliant! I love it 🙂 So happy this was a hit!! I’m usually pretty disappointed by healthy recipes on the internet but this recipe is awesome!! As a college student, this is a cheap, easy, and quick recipe that lasts the whole week. I just used my favorite vegetables and sausage on a bed of quinoa and it surprisingly filled me up. Thanks for the recipe! I’m so, so thrilled to hear this was a hit! 🙂 Thanks so much for taking the time to comment Lauren! I’m also a broke, stressed college student and this is one of my favorite go-to recipes! I like to use chicken sausage and whatever veggies happen to be on sale at my local grocery store + brown rice. It makes eating a healthy lunch so much easier when it’s already cooked (and didn’t cost a lot to make). I’m so, so happy to hear this!! Thanks Morgan! This was very good. I added zucchini and yellow onion and used Apple Chicken Sausage as someone else had tried. I did have to roast everything an extra 10 minutes. Very good, very easy and healthy. I’ve made this and also your one pan tortilla chicken. I am now a HUGE fan of Chelsea’s Messy Apron! Searching blogs for recipes is my favorite thing… i’ll be a regular here now. I love the simplicity of this dish and lack of… DISHES! I just had twin girls. Need simplicity in my life! Thanks girl! I made this for dinner last night…amazing! i did peppers, red onion, broccoli, asparagus, carrots, red baby potatoes with Chipotle lime chicken sausage. Definitely going on the regular rotation. I was out of parm but will definitely add it next time. I served this over brown rice. This is great for meal prepping for weekly lunches. Hi! you said by the nutrition label that the serving size is 4 if you serve with rice/quinoa…what is it if you don’ t? Thank you!! Love this recipe! Can I use this sausage? I have a ton of it from Costco -? Freeze the sausage for 15 min first then you can slice it easily. Turned out delicious! We doubled the amount of spices for the same measurements of the rest of the ingredients. Really lovely! Would it make sense to put everything into a big bowl and toss it rather than try and mix it in a flat pan? Yes absolutely! 🙂 If you don’t mind one more dish to wash it’s great with a bowl! This dish is delicious! I added a few tablespoons of balsamic vinegar along with the olive oil and cut the potato quantity down by half. Thank you for the recipe. We like to find new low carb dinner ideas and this one was perfect! Looks great! Does your husband eat in cold or reheat it in a microwave at work? This recipe was absolutely delicious! I had some turkey kielbasa on hand so I used that but am eager to try other types of sausage. My husband and toddler (great finger food dish for her) loved it! Thanks! Just finished making this. This dish was excellent! So happy to hear that! Thanks Scott! I’m making this for dinner tonight! It smells so good and it’s not even done yet! Made this 2 days ago and absolutely loved it!!! Could you use bite size pieces of chicken breast? Just wondering if you could put it in raw or cook it first. Is there anything I can change to lower the sodium? Delicious! Easy! Healthy! You are a goddess! Thank you! This was amazing! Awe thank you!! So happy you enjoyed this 🙂 Thanks for the comment! This was Scumptious!!!! Loved the flavor! I totally needed to mix everything together in a large bowl, and then place on the baking sheet! Will make again & again! I came across this recipe yesterday and made it for dinner last night. Hubby and I loved it. We had leftovers for lunch today..yummy….hubby says that I have to make it again and again….thank you for sharing.. This recipe was simply AMAZING. I’m a firefighter, and I’m always on the lookout for relatively cheap and easy healthy meals that the fellas will still actually want to eat…and this totally fits the bill! The seasoning blend was delicious! This is definitely going into my “keeper” cookbook for when my cook rotation comes up. This was delicious! I used a skinless smoked sausage with red bell peppers, zucchini, onion and fresh green beans. Didn’t have broccoli. I served it over quinoa with freshly grated Parmesan. My 10 year old had 2nds and my husband had 3rds….There will even be enough leftover for lunch for my husband tomorrow. #winning! Thank YOU!! You are so welcome!! I’m thrilled it was a hit 🙂 Thanks for the comment Mary! AMAZING!!!! It’s getting added to our family dinner menu rotation immediately…loved it! Tried this tonight and it went over great. This recipe is definitely man proof. I used quinoa cooked in organic chicken broth. I also used liquid amino on my serving. The spices are great. This will definitely be a go to meal. Thank you. This was the best recipe so far in 2017. I could eat this once a week forever. So adaptable.. Farmers Markets will give me tons of new options for summer… but that spice blend and easy prep is just a winner. Can’t thank you enough! Easy and delicious! I made this for dinner tonight. I am not a big fan of bell peppers so I didn’t use them. However I did add some tomatoes and the taste was perfect! Will definitely be making this again! This recipe had great tastes to it but I couldn’t get each vegetable cooked through before others were going to be overdone. I’ll blanch the green beans first next time, and roast the potatoes separately for longer. Made this again tonight… can not believe the versatility… used potatoes and asparagus instead of broccoli… People are screaming for seconds.. served it over a bit of parsley/lime rice… Its a forever keeper in my house..
That makes my day to hear it’s a keeper!! I really appreciate the comment! I made this last night & my kids gobbled it up! I used turkey kielbasa, sweet potatoes & broccoli. I found it a little heavy on the oregano which is why I didn’t give it 5 starts. I’ll cut back next time & add a bit more salt just to the veggies. Looking forward to making it again! It’s a great way to use up extra veg. Is there a reason to use fresh veggies instead of frozen? I have frozen beans and broccoli in my freezer right now and didn’t know if I could still use those? I prefer the taste of fresh roasted veggies. Frozen should work fine, but the cook time will likely be different. Enjoy! I’ve made this 3 times in the last month. So yummy! All of my kids 7-19 love it as does my husband! I have also used sweet potatoes, brussel sprouts and mushrooms & zucchini added the last 15 min. I also mixed up a quadruple batch of spices in a spice jar to have on hand. Makes the prep so quick to sprinkle on the veggies & meat. Thanks for the awesome recipe. Oh, my husband loves to take leftovers in a Thermos to work too! This was great! I split it between 2 pans though. Even the teenagers liked it. Thanks! What’s the calorie count without rice? Made tonight and hubby had seconds. We have more to serve with leftover quinoa tomorrow. Only change I made was to cook kielbasa separately in skillet. Even though I used lower-fat turkey type, I still like to fry and drain fat on paper towel. Maybe adjust seasoning next time like using less paprika and adding fresh chopped garlic later in cooking process. I made his recipe tonight with just a couple of variations because I amdoing the whole 30 program. I found 2 kinds for Ken sausages that were compliant and skipped the parmesan. I made 2 pans so we would have leftovers! The hubs wants the rest with eggs in the morning. Thanks for such an easy meal idea! Sorry for the errors. It’s supposed of say 2 kinds of chicken sausage. Do I cook the turkey beforehand? The recipe looks great, but how long does it keep for in the fridge? I make a lot of meals ahead of time for packed lunches, so I’m hoping that this would keep in the fridge for a couple days. It keeps really well in the fridge! I make it at the beginning of the week and my husband has it for lunch for the next 3-4 days! How much saturated fat is there in this? I’m on weight watchers and this matters. I’m planning on making this tonight. Really yummy! I used local apple chicken sausage (spolumbos) and fried them up first because they were raw. Then followed the recipe as written. (except I didn’t have garlic salt so I used some minced garlic) Cooked up some quinoa and served it over that. Great way to get lots of veggies in! Melissa, that sounds delicious! I don’t know if I’ve ever tried apple chicken sausage, but i’m definitely adding it to my list! I love how easy it is to get my veggies in too with this meal! Glad you enjoyed! I make this with marinated chicken or pork…no breading so no sogginess. When you make this for lunch for the next day/s . Do you heat it up on the day or eat cold? The sausage used is your main evil doer for the sodium, fat and cholesterol. It’s a processed meat and as my Dr. tells me NO. Not that it stops me, I just eat it far less often and I like to use fresh chicken brats from a near by place were there is only chicken, some fat and seasonings. NO Nitrates or Nitrites or other garbage. Still a process meat but not as bad. So if you would like to reduce some of those numbers I would recommend checking out local butchers for fresh chicken or turkey brats with no nitrates, nitrites or other filler. That or use chicken or turkey meat diced up. I don’t usually do a lot of cooking – never been one of my fortes lol. But I made this today and it turned out delicious! It was so easy to make. I used zucchini and yellow squash, green and red peppers for the veggies along with potatoes and beef sausage. Used Italian seasoning, because I had it handy, and an Italian mix of cheeses. It’s so yummy with some rice! I know I’ll be making it again and again! Thanks for the recipe! Hey, this looks and sounds awesome. My only question: the nutritional facts are including the potatoes and quinoa, correct? Do you know what it looks like without both (or at least the quinoa)? I’m sorry I don’t; I’d recommend My Fitness Pal to plug in your individual version 🙂 Enjoy! I made this tonight. Delicious!! I used canned sliced potatoes. And I used Wilshire kielbasa instead of sausage. Used frozen carrots. Again DELICIOUS! Definitely on my “make again” list. I didn’t put over rice because you already have potatoes in recipe. Making this for dinner tonight! Thanks from New Zealand! When you used this for meals during the week, did you reheat or eat cold? And if you reheated it, how? Microwave or oven? This was amazing. I just added radishes. I had the roasted once and loved them I saw them when I was shopping and grabbed them too it was so good. This was GREAT!!! Even my teenaged granddaughter came back for seconds. I used whatever vegetables I had in my fridge in addition to those listed: asparagus, sugar snap peas (steamed a bit first), broccoli, onions. It came out fantastic. I had some mozzarella stuffed sausage in my fridge also that I used. Will definitely make again. I’m working my way through all the sheet pan recipes, lol. My husband thought it was a Blue Apron meal which we have used before. I have a hard time finding dinners that my teenage boys will eat. One loves all things meat and sausage and the other is almost vegetarian. I have made this several time with a quality turkey or chicken sausage and everyone loves it. We put extra veggies in and they can’t get enough. Thank you! Tried this as a quick and easy option for an early pre-concert dinner, and it fit the bill perfectly! I prepped everything the night before, then threw it together right after work. I used sweet potato instead of regular, and added onion, mirliton, mushrooms to the other veggies and used 2 types of chicken sausage. So simple to just use what you have and it got rave reviews; it will definitely go into my regular rotation. I packed up the extras for lunches throughout the week. Thanks for a keeper recipe! Hi there – This looks like a great recipe to take for lunch at work. The only change I will make is to use Kielbasa instead of Sausage. Thanks again. Just made this and we loved it! BF wants this every day. I see many people upset over the amount of oil in the recipe. No big deal, I used just enough oil to lightly coat the veggies. Substituted the oregano with Montreal Seasoning. Mainly because I wasn’t in the mood for an oregano flavor at the time I made this. And added garlic powder. No other seasonings were needed. 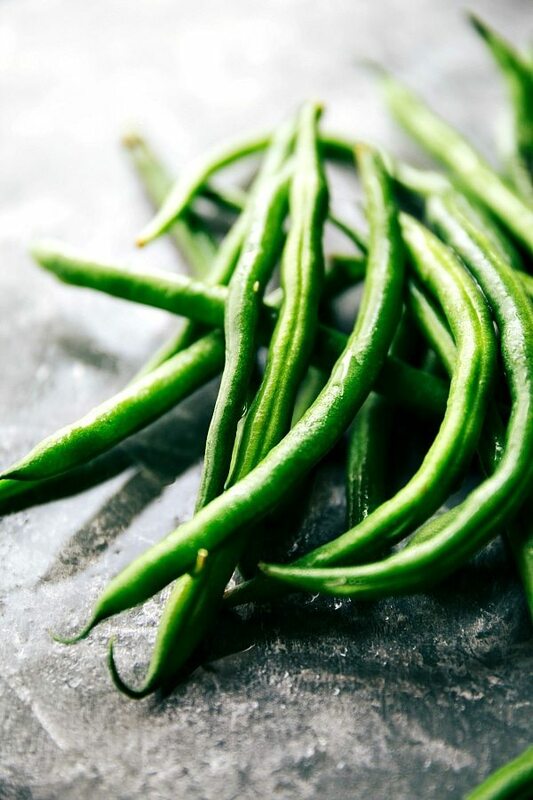 I had so many veggies I was worried things wouldn’t cook timely, so I blanched the green beans. Andouille was my choice of sausage and basmati rice. Added parmesian cheese when the veggies were done and put back in the oven to melt. Otherwise, that’s it. No other changes. Will be making again! Thank you for the recipe!! Thanks for the review Cathy! This was incredible! I’ll definitely be putting this recipe into my meal planning rotation every month. The fresh parmesan on top was the icing on the cake! Could use sweet potato instead of reg potatoes? This was absolutely AMAZING!! I was short on time and it came together so quickly. I paired it with basmati rice and a quinoa mix and it was so filling and full of flavor :)!! Thanks for this recipe! I love how versatile it is. I did it with kielbasa (it’s what I had) and boiled the green beans instead of roasting them, since I was out of oven room. I also upped the potato count instead of adding the rice. It turned out lovely and kept me going through several long days at work. I loved this recipe! Lots of flavor. I followed it to the “T”. I usually do not comment on recipes that I have tried, but I thoroughly enjoyed this one. Definitely a keeper in my book. I would only change one thing when I cook this again and that is the amount of olive oil. I will reduce it next time. Thank you for sharing! Yay!! Thank you for the comment Megan! Instead of quinoa or rice, would cauliflower “rice” work? Thanks. Planning on this for Easter dinner w/guests. Looks gorgeous; haven’t ever used cauliflower rice–hence, the query. I would like to try this recipe but I do have some questions. 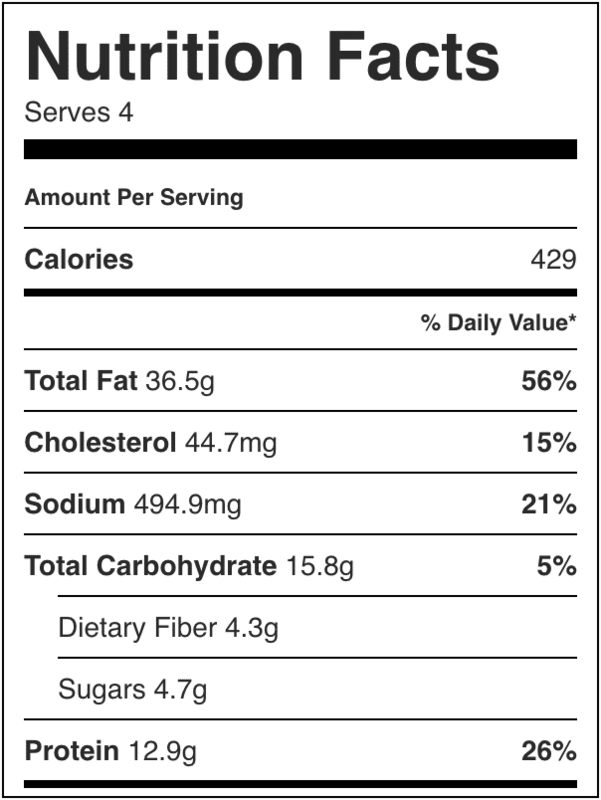 The nutrition facts posted is it per serving or the whole pan? And also if I were to try this with chicken would I put the chicken raw? Per serving 🙂 And yes, you bake the chicken raw! Enjoy! Delish! Even my two toddlers enjoyed it! This recipe was delish and sooooo easy! Packed a kick (I did a heaping 1/4 t of red pepper). I did alter the oil to 2 T. It was PERFECT, thank you for making a recipe that is healthy and will fit into my hectic life! My super picky husband liked it as well. Sounds delicious! I’m so glad you were able to make it work! Enjoy! Made this tonight and hubby and I loved it! Thank you so much for sharing. It was delicious Chelsea!! I didn’t use everything in the recipe, but I followed it very closely. This is a keeper for sure..thank you for sharing it! I LOVE hearing that! So thrilled it’s a favorite 🙂 Thanks for the comment Elaine! I’m obsessed with this recipe. I’ve made it many times now with many diffeeent vegetables. Thank you for an awesome herb combo! I like to use Pederson’s organic smoked sausage, sweet potatoes, bell pepper, asparagus, and green beans. It freezes well in lunch portions too. Thanks again! Great recipe. It came out looking beautiful and the whole family loved it. Like you said, it was pretty easy to put together, even for a non-cook like me. I added a bit more red pepper flakes than you suggested, which gave it a nice zing. Thanks for putting this out there for the masses. Amazing! Made this tonight and it was a hit! Used a whole pound of sausage. The smell is wonderful while cooking and the flavors just pop! I don’t normally comment on recipes but just had to here. 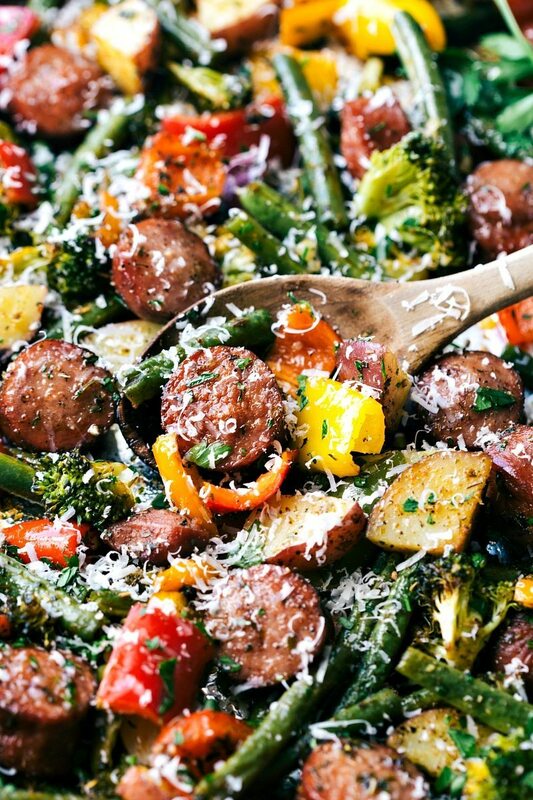 If you omitted the sausage this would be a great side dish to a grilled steak, too! Hi! this looks great, I’m trying to meal prep and make more lunches I can take to school. What would you say the shelf life is for this meal? SO! Too much olive oil, as stated by others. Also you’ll want to avoid the part of the directions that tells u to mix ur now seasoned veggies in the baking sheet. Huge mistake! I’m mixing in a bowl before sheeting next time. It smells delicious but it takes much longer than 10 minutes to prepare. Also concerned that the brocoli is turning brown after 15 in the oven but the potatoes (which i cut tiny) are going to need at least another 30. All total this will take about 2 hrs, not 40 minutes. Another thing i want to say is that the amount of veggies in the recipe makes MUCH more than 4 servings. I used1/2 what it calls for and my baking sheet is overflowing, which is probably why these potatoes are going to take so much longer. It’s still going to taste good; i just wasn’t expecting this ? This one-pan dish looks amazing, Chelsea! But for vegetarians following a strict Ketogenic diet, does replacing smoked turkey/chicken sausages with vegan sausages or vegan patties change the overall taste and quality of the dish? Do you have good recipe suggestions for fellow vegetarians in a Ketogenic diet? To know more about Vegetarian keto, the link provides information about the diet. So good! I subbed asparagus and mushrooms in for the broccoli and potatoes. I served it with lemon herb basmati rice. Thanks!! Yay! SO happy to hear this is was a hit ? Thanks for the comment Krista! ? Yummy! Love it! I’m going to try this someday! Easy and delicious! Thank you for the recipe. We really enjoyed it. I used Kroger brand Polska Kielbasa, large chunks of onions, red, green, and orange peppers, and regular potatoes (we didn’t have red). The shredded parmesan cheese was the perfect topping for it. Family loved this, it will become a regular weeknight dinner. Hubby wants to add onions, and I hate them, so we’ll make on two cookie sheets instead of one large pan next time. I found that seasoning and coating was easier in a bowl than on the cookie sheet. Thanks!